A six-month-old bear cub had to be rescued after he got his head stuck in a jar. 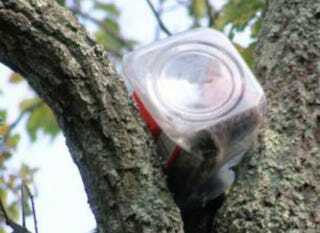 Larry Ragonese, spokesman for the New Jersey Department of Environmental Protection said the bear got his head stuck in an oversized animal cracker jar, possibly from someone's trash. (It looks like one of those big plastic tubs of snacks they sell at Cosco.) "He was trying to eat what remained in the jar and pulled the jar over his head," Ragonese said. "He got spooked and went up into the tree." Ragonese said while it's rare for a bear to get into such a jam, state wildlife officials have "seen something like this previously." The problem, he said, goes back to homeowners not taking care with their trash, which invites animals like the black bear to come around seeking a snack. When folks live in bear country, they should be utilizing bear-proof trashcans and not placing unprotected trash at the curb overnight for morning pickup, and "then you won't have Winnie the Pooh," he said. That's right, folks. As adorable as Winnie the Pooh getting a jar of honey stuck on his head is, that is not something you should try to recreate in real life. I cannot stress this enough. Image via State Dept. of Environmental Protection.